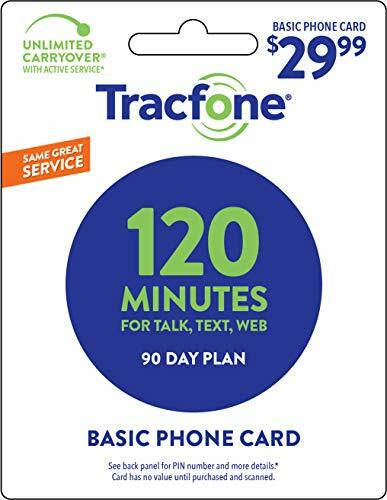 The phone SIM cards have come a long way as technology has evolved over the years and the creation of the Nano SIM card is the perfect example of this. While not all phone manufacturers have transferred to the use of Nano SIM card. 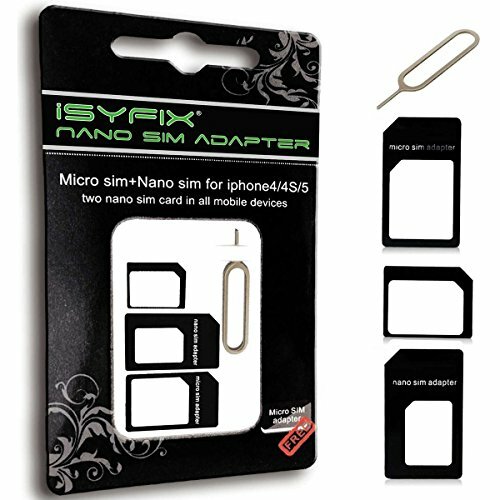 Our iSYFIX Nano SIM card adapter / Converter kit will allow you to still use your Nano SIM on almost any older mobile device without any problems and convert your sim between sizes, this operation is fully reversible. Convert your Nano Sim card to Micro Sim card. Convert your Micro Sim card to normal size Sim card. Convert your Nano Sim card to normal size Sim card. 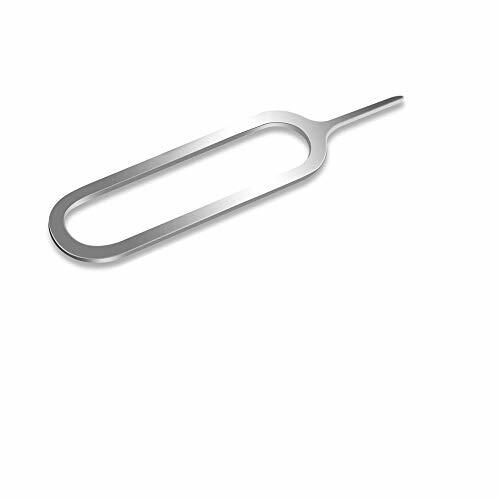 Easily eject the sim card with the included steel sim eject pin. Build with high quality materials with precision carved molds to fit perfect. Never insert a Nano sim card adapter in the phone without a SIM. The phone Sim tray could get stuck. 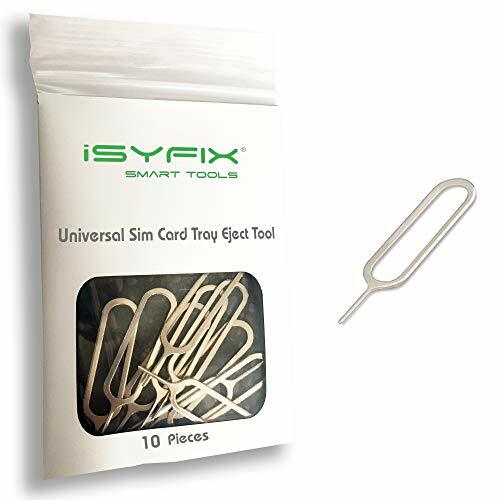 THE iSYFIX Nano Sim Card Adapter Kit helps you to convert a NANO SIM CARD into a MICRO SIM or a STANDARD SIM CARD, and a MICRO SIM CARD into a STANDARD SIM CARD size for any cell phone or tablet. IT IS COMPLETELY REVERSIBLE, the nano to micro sim adapter is very handy to switch easily the sim card between different devices, cell phones or tablets. HIGH QUALITY MATERIALS and CNC carved to fit perfect. Fits all older phone models like iPhone 3GS, iPhone 4S and any other normal or micro sim card devices. Compatible with all manufacturers like: Apple, HTC, Huawei, LG, Google, Samsung, Sony, Motorola and more. SUPER EASY INSTALLATION, only take seconds. No tools required. We advise to use your iSYFIX Nano Sim Adapter always with a manufacturer cut sim card and never insert it in your phone empty. 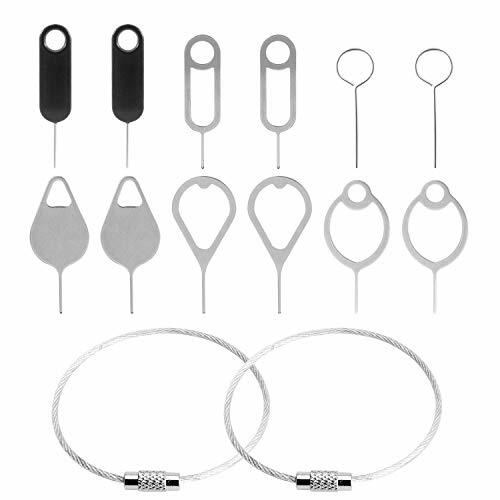 INCLUDES: 1 tray for Nano to Micro, 1 tray for Nano to Standard, 1 tray for Micro to Standard SIM card and 1 steel eject pin. The iSYFIX brand is owned and exclusively operated by Super-Deals-Outlet. 1 Year Manufacturer Guarantee. 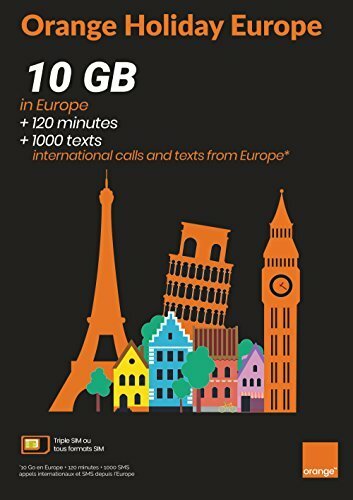 12GB data to use in 71 destinations, 3000 voice mins and 3000 texts can ONLY be used to call UK numbers, AND European numbers WHILST you are in Europe. Use in a phone only. No tethering, personal hotspot or video streaming allowed. Easy activation, No personal ID required for registration , Plug and go. 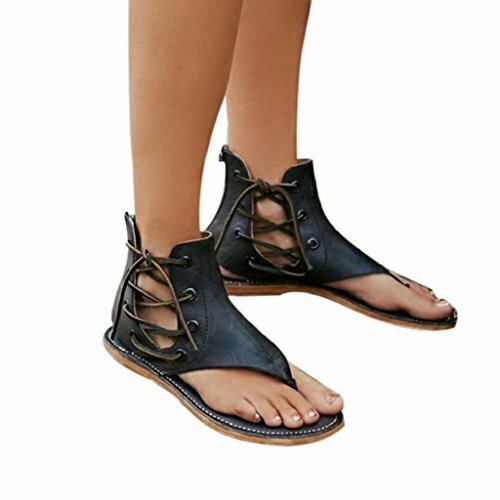 Ideal for the European Travelers. Trio SIM suitable for all cell phones. Can be recharged for more data. New, Sealed, Never Used, Never Activated. Micro/Standard/Nano SIM Card - three in one. For GSM cell phone or Apple iPhone or other compatible tablets. For Prepaid usage. No Contract. 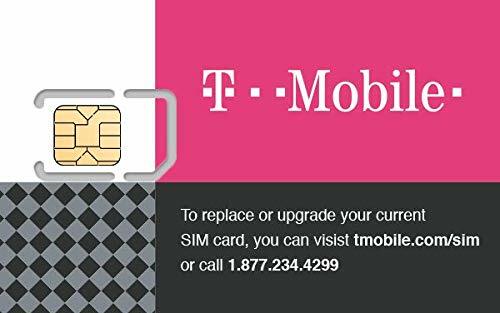 Use your own device - activate any T-Mobile or unlocked compatible GSM cell phone, Apple iPhone, or other compatible tablets. Ready to use. Activation Code included. Buying an unlocked, compatible phone or tablet? 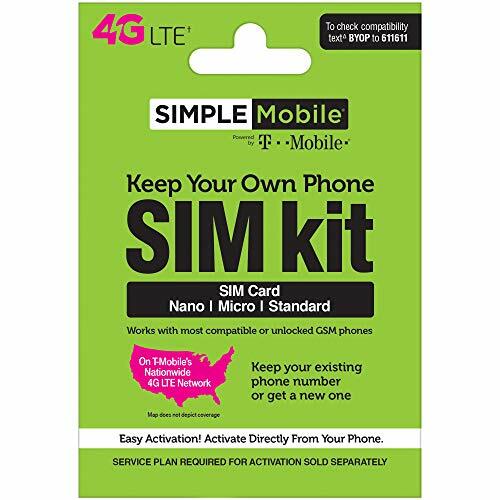 This Complete SIM Kit allows you to choose a plan and connect to T-Mobile's Nationwide 4G LTE network. Punch out the ready-to-use Nano SIM, slip it into your phone or tablet, and you're ready to go. Convert your unlocked phone into a prepaid phone with this SIMPLE Mobile BYOP SIM Kit. Easy to use, it is compatible with GSM Unlocked Phones or T-Mobile phones with micro, Nano or standard sim cards. 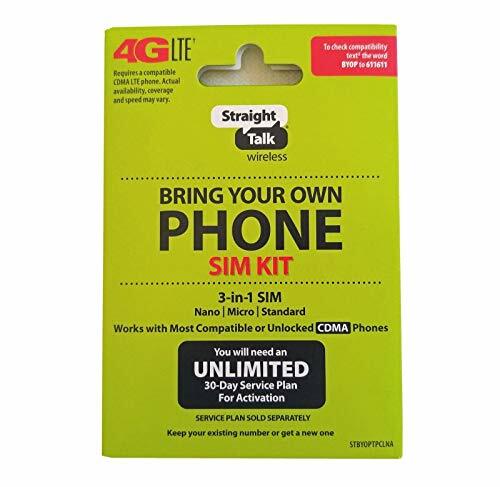 This SIMPLE Mobile sim kit requires a compatible phone, the activation kit and a service plan. Activate your phone by simply following the instructions included in the package. Works with Alexa. KIT INCLUDES: Universal SIM Card for you to activate your phone with Simple Mobile. SIM Card sizes include Standard, Nano, and Micro. COVERAGE: Simple Mobile has Nationwide Coverage on a Lightning-Fast 4G LTE Network. WHY SIMPLE MOBILE: No Long-term Contracts, No Mystery Fees, No Credit Checks, and No Hassles, Ever! BENEFITS: Keep your phone, network, and phone number. Compatible with most GSM Smartphones such as Samsung Galaxy Series, HTC, LG, and all Apple iPhones. Airtime: Plans sold seperately. Available on Amazon. 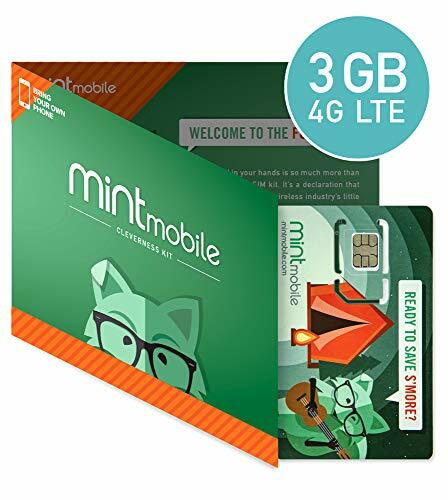 Mint Mobile's $5 Starter Kit lets you test out our wireless service before we go "all the way" together with a full plan. The test SIM allows you to make a call, send a text, and surf the web-everything you need to make sure Mint works great with your device and location. Once you purchase a kit, download our free Mint Mobile app on iTunes or Google Play. The app will take you step-by-step through set-up and activation so you'll be ready to try us, love us and join us for reals, with minimum risk and hassle! Why can't everything be this way? We'll even credit the $5 back when you purchase any full Mint Mobile plan through the Mint app after your trial, which means you get premium wireless service for just $15/month AND the credit-score! The iSYFIX Sim ejector Pin is essential to travel. THE SIM TRAY EJECTOR BY iSYFIX Opens and help to eject the sim card from the tray on your devices. This Sim Tool guarantees the efficient removal of the Sim from the tray. The Sim Tray Ejector iSYFIX, it's a good sim card eject tool replacement. IT IS COMPATIBLE with different devices, cell phones or tablets. This Sim Card Eject Pin iSYFIX for Smartphones is easy to use. For use this Sim Eject Tool, just insert the straight end of the Sim Eject Tool into the hole next to the Sim port and remove your Sim Card from the Tray. HIGH QUALITY MATERIALS to fit perfect. Fits all older phone models like iPhone 3GS, iPhone 4S and any other normal or micro sim card devices. Compatible with all manufacturers like: Apple iPhone 7, 7 plus, 6 plus, 6s, 6, 5, 5c, 5s, 4s, 4, iPad, iPod, HTC, Huawei, LG, Google, Samsung, Sony, Motorola and more. Also known as a bring your own phone (BYOP) kit, this activation kit allows you to convert your current compatible or unlocked phone into a prepaid phone. 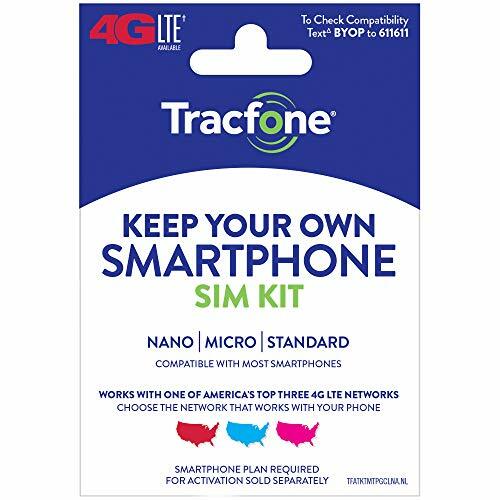 This activation kit is compatible with AT&T, T-Mobile and CDMA phones with micro, standard, or Nano sim cards. KIT INCLUDES: Universal SIM Card for you to activate your phone with Trachoma Wireless. SIM Card sizes include Standard, Nano, and Micro. COVERAGE: Get 4G LTE Nationwide Coverage from one of the top three Networks. 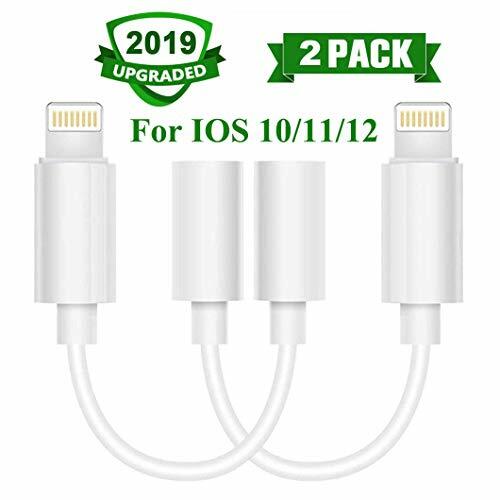 BENEFITS: Keep your phone, network Compatible with most smartphones such as Samsung Galaxy Series, HTC, LG, and all Apple iPhones. Check Coverage at STKMap New, Sealed, Never Used, Never Activated. Monthly Plans starting at just $5. Activate with any of SpeedTalk's Nationwide wireless service plans. Port in (keep) your existing phone number or get a new one. Easy activation. SIM card is pre-cut, Standard, Micro and Nano. Punch out the size you need for your wireless device. No Contract. Ready to use. Activation Code included. 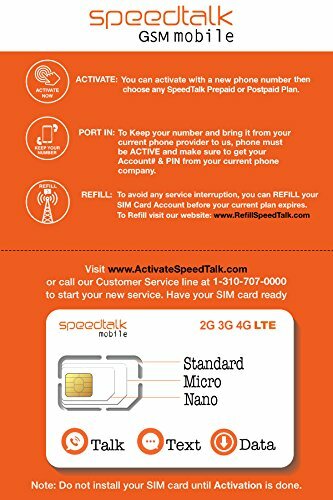 Our service will work within the UNITED STATES ONLY Choose from a variety of Monthly Plans starting at just $5, see plans at SpeedTalkMobile. Bring your own device and keep your number. No Credit Checks or activation fees. To activate please visit ActivateSpeedTalk . 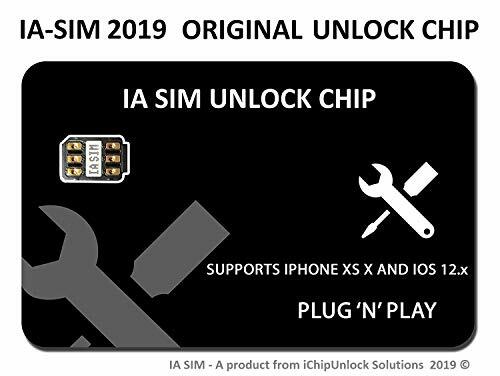 Our SIM card can be used with any unlock GSM device such as but not limited to GSM Unlock Cellular Phones, Apple iPhone, Android, Windows, GSM Home Alarm Systems, Smart Watches, GPS Trackers, Car Alarm Systems, Kid GPS Trackers, Pet Trackers. SpeedTalk offers its services through subscription plans which auto-renew every 30 days. Service begins as soon as you activate your service. You'll be charged the rate stated at the time of purchase, every month, until you cancel. There is No Contract, Cancellations can be made any time by contacting customer support. A valid credit card is required to cover overages in case you exceed the applicable Voice, SMS and Data limits. To avoid overage charges, you should purchase the appropriate plan for your anticipated needs. 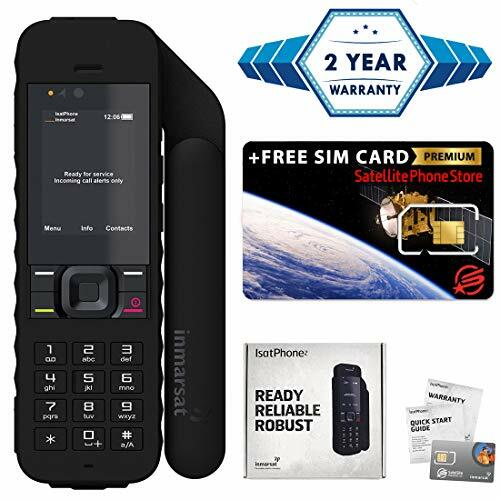 Our SIM card can be used with unlock GSM devices such as but not limited to GSM Unlock Cellular Phones, Apple iPhone, Android, Windows, GSM Home Alarm Systems, Smart Watches, GPS Trackers, Car Alarm Systems, Kid GPS Trackers, Pet Trackers. Activate with any of SpeedTalk's Nationwide wireless service plans. Port in (keep) your existing phone number or get a new one. Easy activation. SIM card is pre-cut: standard, micro and nano. Punch out the size you need for your wireless device. Please verify from straightalk.Com to see if your phone is compatible with this item. Do not accept returns in opened condition. Come with sim card remover pin. Kit includes Nano, Micro and Standard SIM cards. Also includes Network Access Code which is required by Straight Talk to active your phone. This kit is for Straight Talk bring your own phone program that offer unlimited TALK/TEXT/DATA for $45. Unlimited data includes 5GB LTE data. For CDMA phones requiring a SIM Card such as Verizon iPhone, Verizon Galaxy phone or other unlocked CDMA phones. NOT COMPATIBLE WITH AT&T OR GSM PHONES. Now you can Bring Your Own Phone to America's largest most reliable network. Bundle to get Unlimited Talk, Text and Data. First 5 GB Data at High Speeds then 2G*. SERVICE PLAN OPTIONS: Package includes free Global SIM card ready for prepaid or monthly plan activation with Satellite Phone Store. No hidden fees and it's simple to activate. Purchase minutes whenever you need them, or get setup with monthly service and enjoy uninterrupted connectivity. PACKAGE INCLUDES: Inmarsat IsatPhone 2 satellite phone handset, Lithium-ion battery, International AC wall charger with international plugs, Car DC charger, Holster with a belt clip, Hands free earpiece, Lanyard, USB cable, USB thumb drive with documentation, Quick start guide, Satellite Phone Store SIM card and 1 year manufacturers warranty. SHOCK, DUST AND WATER RESISTANT: IK04 shock resistance rating and an ingress rating of IP65: the IsatPhone2 can withstand dirt, dust and jets of water from every direction. It has a humidity tolerance of 0 to 95%, and an operational temperature range of -20C to +55C (-4F to +131F). An innovative display technology provides enhanced daytime visibility. Longest lasting batteries of any satellite phone with 8 hours talk time and 160 hours standby. 24/7 CUSTOMER SUPPORT: Satellite Phone Store proudly offers Free 24/7 global customer support. Now answering machines - No waiting. Anytime you call an expert will answer the phone and immediately assist you. 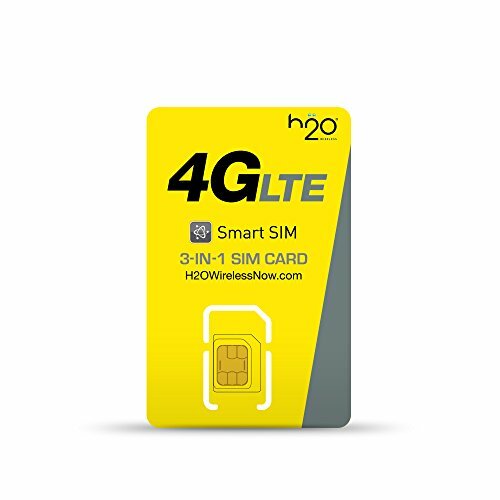 h2o s 3-in-1 (Triple) SIM Starter Kit is the all in one solution for your no contract wireless service needs. Each kit comes with a standard, micro, and nano sized SIM to fit your unlocked phone. Get started with any smartphone including brands Samsung, HTC, LG, or iPhone. Smart technology automatically configures the h2o data settings once you plug in the smart SIM to your phone. Monthly Unlimited plans offer 4G LTE Data or you can Pay As You Go. Learn more at h2owirelessnow.com. You just found the lowest prices in wireless. Period. Mint Mobile lets you buy in bulk for huge savings on the nation's fastest, most advanced 4G LTE network. Our digital-only footprint and BYOP-friendly philosophy helps us keep prices way below everyone else. Choose from our 3-month plans with 3GB, 8GB or 12GB of 4G LTE data per month. Plans include unlimited nationwide talk, text and data. Mint Mobile works on unlocked, GSM-ready phones. 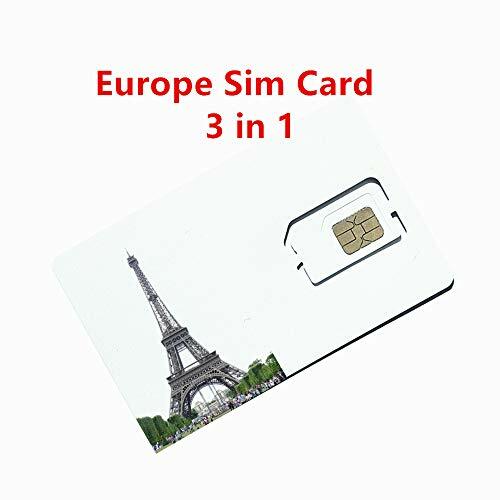 3-in-1 SIM card included fits any device. Notice to California-based customers: prepaid wireless consumers located in the state of California are subject to a Prepaid MTS Surcharge on their wireless service. This surcharge will be displayed as tax during the checkout process. Please visit mintmobile.com/CA-MTS to learn more about the Prepaid MTS Surcharge. 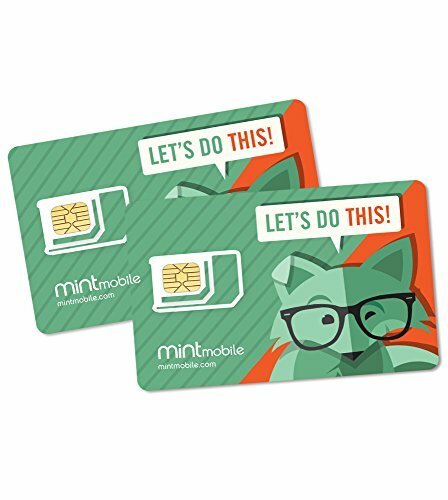 C'mon, aren't you dying to use the phone plan with a cute little fox on everything? NOTE: According to the customer's feedback,it is recommended that you buy a large one ,Pls check the size before you place order. You will receive a paper print out in the mail containing the 15 digit PIN Number (not a plastic "card") No bills. No surprises. You're in control. This TracFone PIN adds 60 minutes and 90 days to service end date. One of the lowest priced no contract plans in the market today. At Cricket wireless, we make joining our nationwide 4G LTE network quick and easy. All you have to do is follow the step-by-step Instructions provided to replace the SIM card in your current, unlocked Compatible phone with our 3-in-1 SIM card. Once finished, you can enjoy talk, text and data access with Monthly taxes and fees already included, and No annual contracts. Simply visit Cricket wireless/join to activate, and you re good to go! 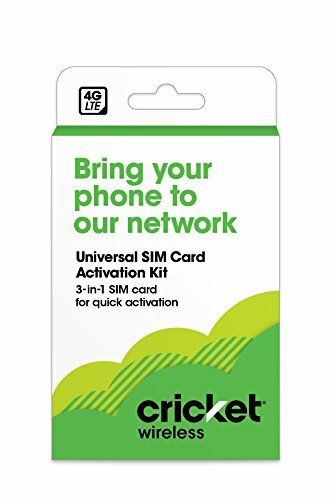 KIT INCLUDES: 3-in-1 Universal SIM Card for you to activate your phone with Cricket Wireless. This kit will work with most unlocked, GSM compatible phones. WHY CRICKET: No annual contracts, no monthly taxes, and no activation fee at - all on a network with nationwide 4G LTE coverage. ACTIVATION IS SIMPLE: Activate straight from your phone with Cricket Breeze-Thru. ADD LINES AND SAVE: Get 4 lines of Unlimited Data for per month or 2 lines of Unlimited Data per month. Efficient Transmission and Stable Signal: 100% Copper wire core offers clear crisp sound quality and ensure the stability of transmission for better and comfortable experience. High Quality Metal Joint Produced with First-Class Technology Design: The specially crafted alumina housing makes the product more wearable, high-end and enhances anti-jamming capability. * Easy to storage carry depend on plastic sleeve, Don't lose it. Sim card adapter made of quality PC material, CNC carve, precision size, clear texture, thin basement membrane, durable, support bend over and over again. Nano sim can be restored Micro sim or standard sim,then Nano sim will match all of mobile devices,Micro sim can be restored standard sim to match to standard sim mobile devices. Enjoy nationwide coverage on AMERICA'S best networks with the Net10 activation kit. It lets you connect your own phone to a Monthly plan that features unlimited talk, text and data. You can also keep your current number and eliminate the worry of credit checks, hidden fees or getting locked into a contract. This activation kit is Compatible with all phones with a micro, Nano or standard SIM card. Works with Alexa. 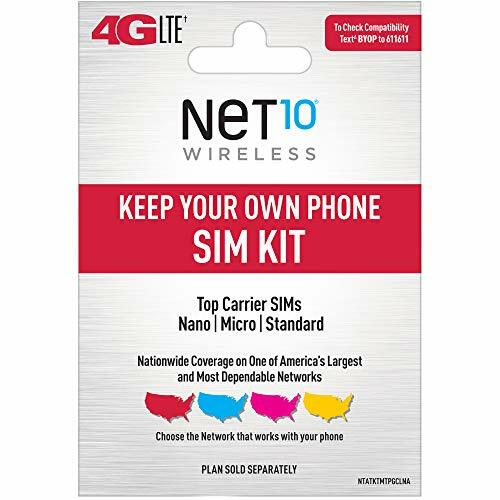 KIT INCLUDES: Universal SIM Card for you to activate your phone with Net10 Wireless. SIM Card sizes include Standard, Nano, and Micro. COVERAGE: Get 4G LTE Nationwide Coverage from one of the top four Networks. BENEFITS: Keep your phone, network, and phone number. Compatible with most smartphones such as Samsung Galaxy Series, HTC, LG, and all Apple iPhones. OOTSR Universal SIM Card Tray Eject Pins for All Smart-Phones, Different Stylish SIM Card Pin Ejector Removal Tool Needle Opener for Smart-Phones Such as iPhone Samsung HTC Sony Xperia Google etc. 12 pieces of those SIM card removal tools sell together, you can put them in several certain places for back-up, such as office, bedroom, or handbags. Also, you will not really need all 12 sim card tray eject pin key tool for your iPhone hence, you may consider sharing some sim ejection tool to your friends. 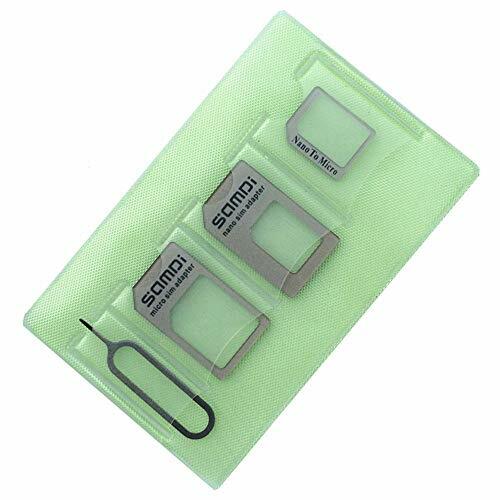 SIM Cards opening tools can easily open and eject the SIM card tray on all the smart phone devices. These sim card tools are thin and compact,but they does not flex when pressure is applied. [Compatibility] Different Universal SIM card tray eject pins for replacing SIM cards from our mobile phones, such as Samsung Galaxy smart phones, all iPhones, HTC, Sony, Google Pixel smart phones, OnePlus 6T/OnePlus 6/OnePlus 5T/OnePlus 5. etc. [Different Style] 12 pieces of SIM card needle openers of different designs to meet different people's preference, and we have equipped with 2 keychains for packing those removal pins not to drop off. [Premium Quality]Those sim card eject keys are well designed to ENSURE that they are not easily BENT or BROKEN. Our sim card tray open eject pins are manufactured using a fine metal alloy. Our worry-free 12-month warranty and friendly customer service. With this SIM Card Eject Pin, you can easily open, remove, eject the SIM card Tray Widely Compatible This Sim Ejector Card Tray Eject Pin Removal Tool works with all smartphones Apple iPhone X, iPhone 8 Plus, iPhone 8, iPhone 7 Plus, iPhone 7, iPhone 6 Plus, iPhone 6, iPhone 5, LG, Lenovo, Lumia, Huawei Mate 9 10, Honor 8 9, P10 P9 P8 P7, Honor 5x 6x 7x, Samsung Galaxy J2/J5/J7 Prime, J3 J5 J7 2017 , A3 A5 A7, S9, S9 Plus, S8, S8 Plus, S7, S7 Edge, S6, S6 Edge, S6 Edge Plus, S5, 4, Note 5, Note 8, Sony, Acer, HTC, Motorola and other brands of android devices. . Our worry-free 12-month warranty and friendly customer service. USING: This should work for anything that has a small opening that a straightened paperclip can be used on such as a CD/DVD drive on some PCs, reset button on certain modems/routers, etc.